It is about time I update this blog, only I haven’t been up to much that is interesting to write about. All the pear trees are in bloom which makes the back yard really pretty. Craft-wise I have been playing with Belle and doing all the exercises in the Bernina Mastery Workbook. I am about half way through. 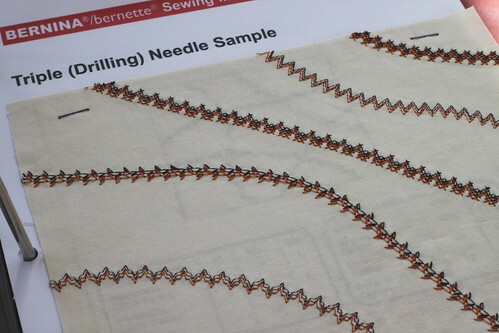 Belle is my first Bernina machine, so I know many people did these exercises years ago. I need time to decide on my next big project, and none of my UFOs are drawing me to finish them. Even though I have been sewing for many years, it has been nice sew samples of techniques I am good at and the ones that catch me off guard. I especially liked the double wing heirloom technique. I hope to find a project to use it on soon. I didn’t get the middle holes to line up perfectly on my first row of the chain design. The second row shown on the top is better. I had never played with a triple needle either. These were fun to stitch out. Fringing is a technique that at first was hard for me to get right using the workbook directions. I changed where it says to remove bobbin thread carefully, to cutting the bobbin thread right down the middle. Then the fringe was easy to sew. I want to play with this more. I like the decorative stitch I used on the left side, not so much the one on the right. I have done all the samples in the first 4 workbooks and am to the quilting part of workbook 5. It has been nice just playing around this month, trying all the different feet and attachments. This entry was posted on Friday, March 19th, 2010 at 5:34 pm and is filed under Bernina 830 and Sewing. Tagged: Sewing. You can feed this entry. You can leave a response, or trackback from your own site. All of your samples are just gorgeous! I can see a lot of uses for the decorative stitches. 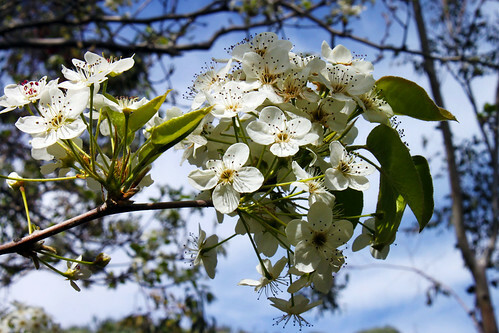 Each has their own beauty – your pear blossoms and all the fantastic samples you have been playing with. Loving the decorative stitches on the sheer (organdy?) fabric…so delicate. 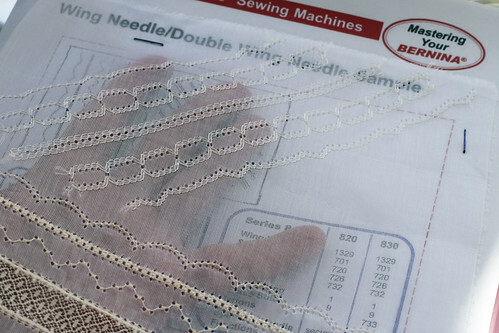 How often do we just sit down and play with our sewing machines – to see what they can do? I am too task oriented and need to lighten up!!! That is when we are open to learning the most…and seeing the most potential. Thank you for sharing and have a great week – sounds like it is getting warm where you are. We are at 10 degrees this morning…brrrrr! Those are lovely blossoms! Hey! I sure miss my blog buddy…YOU! THanks for stopping by to say hello and enter the blogoversary giveaway today! (((HUGS)))!!! 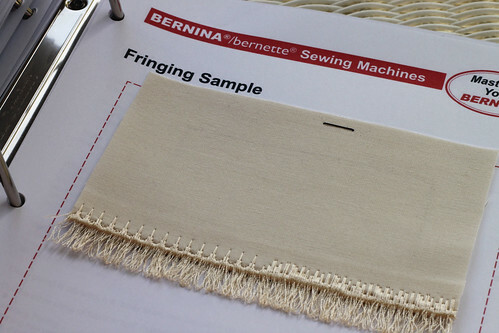 It appears that you have an Bernina 830. How did you decide on this vs a Brother Quattro? 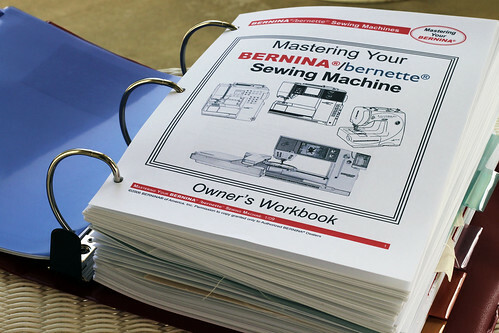 DId your 830 replace another Bernina?